Saudi Arabia’s stock market rose sharply in early trade on Thursday, outperforming other major Gulf markets as it was buoyed by a slew of strong corporate earnings. The main index rose 3.5 percent in the first 75 minutes of trade, with banks and petrochemical firms gaining the most. Al Rajhi Bank added 5.2 percent after its third-quarter profit rose and top petrochemical producer Saudi Basic Industries was up 4.6 percent. Arab National Bank gained 6.0 percent after reporting an increase in third-quarter profit, while Saudi British Bank rose 4.2 percent after posting a double-digit third-quarter profit on Wednesday. A big international investment conference in Riyadh, boycotted by some top Western executives over the killing of Saudi dissident Jamal Khashoggi, drew to a close on Thursday with the government announcing the signing of billions of dollars worth of deals or memorandums of understanding. Saudi Arabia’s Crown Prince Mohammed bin Salman, in his first public comments since the murder, promised to the conference on Wednesday that Khashoggi’s killers would be brought to justice and that his government would work with Turkey on the case. A Saudi banker at the conference said this improved market sentiment. The United States will remain “a key part” of the Saudi economy despite a boycott of the Future Investment Initiative conference, Saudi Energy Minister Khalid al Falih told Elekhbariya state-TV on Thursday. Meanwhile, most other Gulf markets fell in early trade, mirroring a slump in global stocks. In Dubai, banks and real estate sector hurt the index , which fell nearly 1 percent. Emirates NBD lost 1.5 percent and Damac Properties dived 4.9 percent. Arabtec Holding gained 2.2 percent after its unit was awarded a 299 million dirham ($81.41 million)contract by Damac Properties. 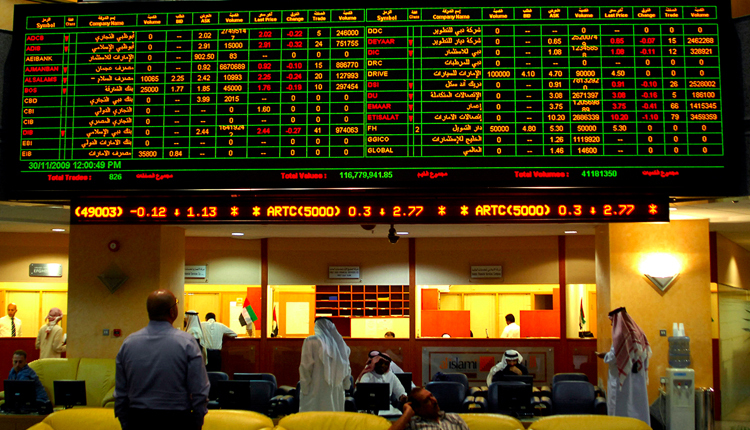 Qatar’s index lost 0.3 percent with Vodafone Qatar dropping 2 percent and Qatar Navigation down 1.3 percent. Mazaya Qatar Real Estate shed 3.1 percent despite reporting a rise in its nine month profit. The Abu Dhabi index dipped 0.5 percent as First Abu Dhabi Bank fell nearly 1 percent and Ras Al Khaimah Cement slid 3 percent.